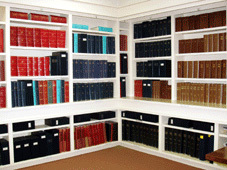 A benefit of Museum membership is unlimited use of the research library. The American Saddlebred Museum has a vibrant membership of Saddlebred owners, breeders, trainers and enthusiasts. A variety of membership levels suit any need. Joining the Museum is a modest, but effective way to support exposure of and education about the breed. *Make a reservation at The Club by calling 859 255 2777. The Club is open for lunch from 11:00 a.m. through the afternoon, for dinner from 5:00 p.m., and closed on Mondays. **Business/Farm Membership includes unlimited ASM visits for your entire staff for one full year, Free Listing in The Learn to Ride and Drive Exhibit (used by visitors every day to locate a stable or lesson barn in their area), AND a plaque suitable for display in your home, office, or barn. Life Members receive a certificate suitable for framing. Support the American Saddlebred Museum today! Your membership makes a difference - it helps present the history and heritage of the American Saddlebred to tens of thousands of visitors to the Kentucky Horse Park each year.